Imagine an election where you have candidates to chose from but you have no idea whom to vote for. Colombia’s presidential elections are just 10 days to go, and yet my (liberal and probably rather left-leaning) friends in Bogotá say that they have no clue whom they should vote for on 25 May. According to the latest polls, it is not clear if current president Juan Manuel Santos (62) will be re-elected, for sure he is not going to make in the first round. The poodle of former president Álvaro Uribe, Iván Zuluaga, has most likely the best chance to challenge Santos and get into a run-off against him three weeks later. The question though is: Why can president Santos not be sure to be re-elected despite the fact that he can present impressive economic numbers and the likelihood to finally end a civil war that went on for six decades is as close as never beforehand? There is the famous saying “It’s the economy, stupid”, referring to the fact that elections are won according to the economic performance of a government. Looking on the surface, Santos can present fantastic numbers about Colombia’s economy. The figures look impressive. In his first term in office, the economy was growing rapidly with an average of 4.6% (Europeans can only dream about such numbers), he was able to put down inflation under 2% (the first time in 50 years). The unemployment rate is down at 10.7% and at various times was in the single digits during his term. During the past three years, three million Colombians were lifted from poverty and one million from extreme poverty (thanks to a program called “Prosperity for all”). Moreover, an impressive $16.8bn of foreign direct investment came into Colombia in 2013. And the traffic jam every day in Bogotá is showing how many people can now afford a car; it is the signal of a rising middle class. And yet, many Colombians do not want to link these rather impressive economic numbers to the president. Why? Many Colombians do not feel they have profited from the economic boom in the last dozen years or so. That does not come as a surprise, as Colombia is the country with one of the highest inequalities in the world. Particularly the urban-rural divide is staggering as this 2013 OECD report presents. Poverty until today is wide spread, affecting some 30% of the people (although this number is done from 47% in 2004) and another 9% is facing extremely poverty. Places like the pacific town of Buenaventura remain godforsaken and Human Rights Watch rightly paints a bleak picture in their March 2014 report. Moreover, about half of the workforce remains in the informal sector as this ILO report shows. That is indeed a huge number and they have to suffer the consequences every day. Moreover, it ridicules in my eyes any official unemployment numbers when half of the working people are not considered there in the first place. Rather surprisingly (as the country has always been reigned by conservative forces since its independence in 1810), Colombia has a minimum wage of COP616,000 (about USD330 or EUR240). Considering the cost of living in Bogotá, it is a surprise for me though how it is possible to survive with such little money. Overall, the economic boom in Colombia is only profitable for a small stratum of society while the huge majority of people lives on credit or has to struggle every single day. It is not only the economy though, Santos himself has focused large parts of his campaign on peace. Although his predecessor Uribe has declared that Colombia would be a “post-conflict country,” it is certainly not true – until today. Uribe tried to frame the conflict as a terrorist threat; in reality though it is ongoing violence with different layers of actors (leftist guerillas like the FARC and ELN, (neo-)paramilitaries, bacrims (criminal gangs) and the army itself) and issues (over land, exclusion, drug production, displacement etc.) that have perpetuated violence. 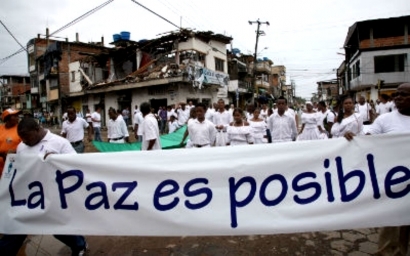 Colombia until today is facing conflict, despite the fact that you cannot feel it anymore in the big cities and armed violence has become a phenomenon in the rural areas, it is the periphery that is mostly suffering today. And yet, Colombia is in a historic transition to overcome its internal violent conflicts that went on since six decades. Currently, there are ongoing peace negotiations in Havana, Cuba, between the FARC and the government and they have reached consensus on several issues like the question of land (the major issue for many people in rural areas) and political participation (to reintegrate the guerilla in society, including political office, similarly like the M-19 in the early 1990s). There has not been an announcement of negotiations with the other major rebel group, the ELN, although it seems likely that when the government reaches an agreement with the FARC, that ELN is going to follow swiftly with a peace deal as well. However, in contrast to the overall rather positive development, many Colombians do not trust the process. This is mainly due to the campaign of angst by former president Uribe who is still enormously popular in some parts of society across the country. According to Uribe and his candidate Zuluaga (Uribe cannot run himself another time as president), any peace deal with the FARC would be disastrous for the country. Instead, the guerilla should be wiped out. Suspiciously, Uribe is never talking about the crimes of the paramilitaries (where his brother Santiago seems to have played a vital role as well) or their successors, the bacrims who control most of the drug trade today. In any case, does have an enormous influence, particularly about the perception of what is going on in Cuba. This is related to the fact that generations of Colombians have been growing up in fear. In addition, there is hardly anyone who would not be able to tell a story where someone in his family or close friends was affected by the horrendous violence, may it be through displacement, someone being taken hostage or simply killed. This traumatization certainly has an impact and it will not be easy to heal the deep wounds that exist in the Colombian soul. On the other hand, all the talk about peace seems surreal to many people in Bogotá and other big cities because there is no conflict to end in the urban reality they are living in. For his next term in office, Santos promised to focus particularly on education and health, indeed two crucial areas where the country is suffering from. Just in December 2013, Colombia was ranked shamefully on the last place in the 2012 PISA study – without any consequences for the minister of education. It is just a reflection that the state of public education is until today on such low levels that it is an obstacle for the rest of your life when you have visited a public school – due to violence in the school, the lack of infrastructure and teachers who have no motivation because of low pay and often do not even show up. Also in health, the state of being is rather difficult for the huge majority of Colombians who cannot afford private health care. Long waiting lines make it difficult in Bogotá, in the rural areas the medical services are very challenging. Although the progressive 1991 constitution promises in theory many rights to Colombians, the reality is different. It does not seem that many Colombians believe Santos that he would be able to bring the change because he cannot show success for his first term of office in these two key areas, education and health. In general, Santos is supported by the mermelada made up of his own party, Partido de la U, as well as the Liberal party (where he originally was belonging to) and Cambio Radical. These parties gained in total 35% in the Senate elections in March 2014. 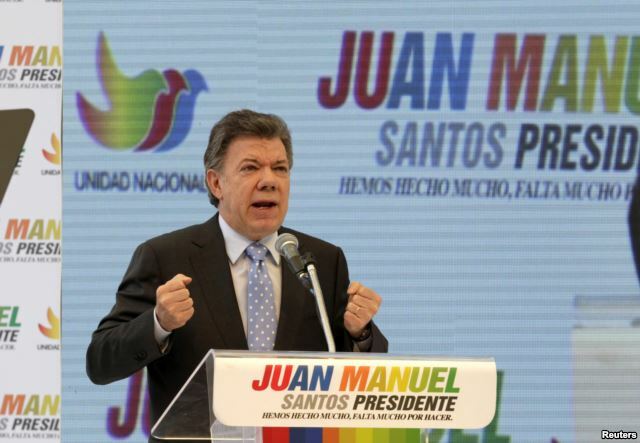 However, in the opinion polls for the presidential elections give Santos at the moment about 25% (ranging from 22-28%) – clearly a slap in the face for a sitting president in Colombia. 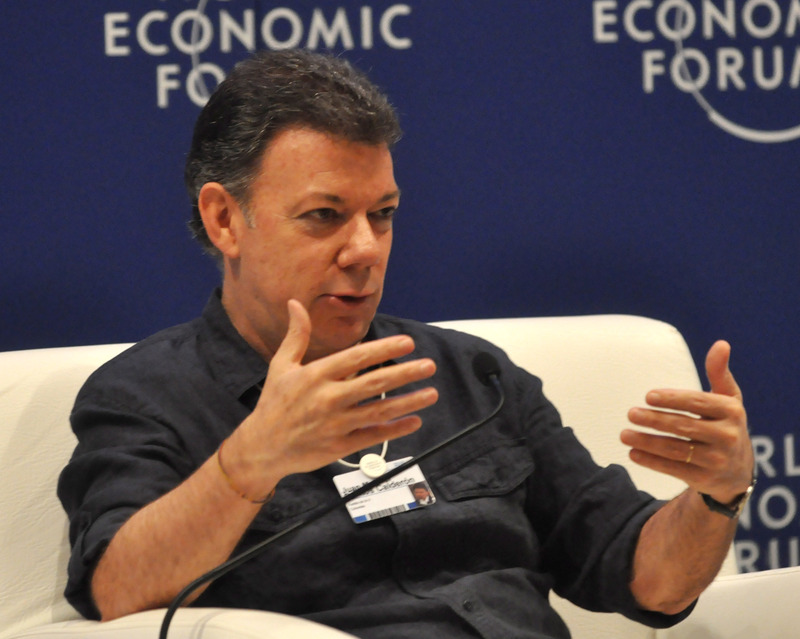 However, Santos was now able to broaden his alliance for peace and the mayor of Bogotá, Gustavo Petro, quite surprisingly does support the president in his initiative to bring peace to the country, thus basically providing a recommendation for very leftist voters to support the president who is very much in the center of the political spectrum (in fact Santos cannot be associated with any ideology as he is far too pragmatic and looking on the polls as his only policy guidance). His pick of Germán Vargas Lleras, however, points to the fact that Santos is reaching out to right-wing and conservative voters. As far as it can be judged according to all opinion polls, Santos will certainly not make it in the first round. However, none of his rivals – neither from the right nor the left – would have a chance in the second round. Nonetheless, it is surprising that the president who has quite a record to show to his people is not more popular. It cannot be enough to just say that Santos is just not the communicator or lacks the charisma of Uribe. 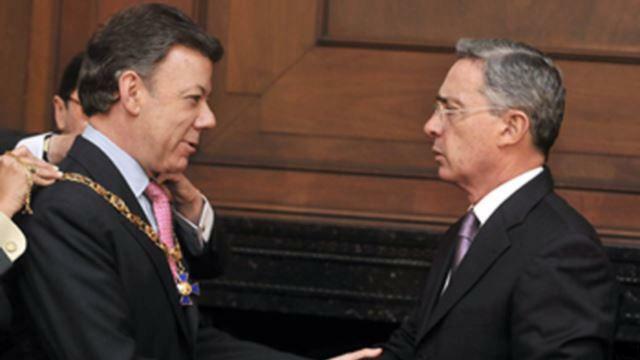 Thus, his approval ratings are just around 45% while Uribe until today enjoys a favorable view of 60% of Colombians. What is worse though is that none of his rivals seem to be an alternative either. Consequently, the majority of people (in Bogotá) do not know who could actually be a person that should lead Colombia in the next four years during a period that will be marked by implementing peace with the guerilla groups but at the same time to overcome the huge structural problems, like in education, health or deeply structural problems like in Chocó. Santos would seem to be the logical option to continue four years in office; however the people of Colombia just do not seem to trust him.